I’ve had a recurring thought these last few months that maybe my friends in Virginia have a call/text list for me. It is so encouraging to get a text or call every now and then, just because. Friends will text me that this or that made them think of me. But it happens not just once in a great while but pretty consistently. Could one of them have said, “Hey listen, you know what Kristie is going to need? She’s going to need to know we still love her, that she is not forgotten, that the Jacksons may not be people we see all the time, but they haven’t fallen off the face of the earth.” I am kidding about the list. I don’t know how that would work, and some of these friends aren’t connected by anything other than geographic proximity. I think these sweet friends are just being sweet friends, without any need for an orchestrating force beyond the faithful promptings of the Holy Spirit. These dear ones are just being biblical, following Paul’s admonition to “encourage one another and build one another up.” 1 Thessalonians 5:11. But I am so very thankful for their faithfulness — so very thankful. How are you doing with that little mental list of phone calls you should make, or friends you should check on? Can I encourage you to send that text or email? Maybe a handwritten note would be a treasure for that person. Maybe the sound of your voice would mean the world to them. This week I heard about two untimely deaths. One a 45-year-old husband and father. One a 25-year-old woman. I knew them both, although not terribly well. But you don’t need to be close to someone to have the gravity of death hit you with force, especially when that death is sudden and decades or a half-century too early. Often our culture tries to live in denial that death is even a reality. I find it horribly sad when empty platitudes –borne out of desperation to feel better in the moment — are all people have to cling to. But I’m honestly not trying to be a downer. It’s Friday and I hope it is full of joy for you and yours. I hope that you know what will happen to you when you die, that you cling to a Risen Savior who loves you, instead of platitudes. I hope, today, you’ll reach out to someone to build them up and give them an encouraging word. Just let them know you are thinking of them. Because one thing in this life is certain: you won’t always have that chance. Do you know where you were in August of 1986? I was getting ready to start high school, which is interesting to remember, given that my oldest son is wrapping up his first week as a high school freshman. But more than starting high school, August 1986 was magical for an entirely different reason. On August 19th, 1986 — thirty years ago today — I became an aunt. My sister gave birth to a huge baby girl with lots of black hair. Sadly, my mom had injured her back that week and so I moved in with my sister and her husband to help with the new baby. I was completely nuts about her from those first days. I remember holding her while she slept, not wanting to put her down. At fourteen I couldn’t care less about getting stuff done, and I never tired of gazing at and cuddling with Caitlin. My teenage self recognized this baby as a blessing, and it wasn’t long before she walked and talked, speaking in full sentences as just a tiny little thing. Yes, that precocious little girl provided many laughs. Even still, as much as I loved her those first years, I could never have fathomed the blessing that she’d be in my life. For thirty years she’s been a light-filled gift, and I can hardly stand the fact that she’s living so far away from me. To say that I’ve put the hard sell for Tennessee on her new husband is a bit of an understatement. But truly, I can so picture them here. In fact, I can pretty much picture Caitlin right by my side wherever I am. So grateful for the all the times these last thirty years that right by my side is exactly where she’s been. So on her 30th birthday I am praising God for her life. What an incredible gift! His unfailing love is always worthy of thanks, and Sweet Caitlin is one of His wonderful deeds! Who can you give thanks for today? I’ve been in Michigan this week, spending time with my mom. It’s always wonderful to be with her — she is not in the best of health, to say the least, but she remains one of the easiest-going, least-complaining, most grateful souls on earth. If you know and love my mom, I would so appreciate your prayers for her. She asked my boys to pray specifically that she’d just feel well enough to do a little cooking and things around the house. See, even her prayer requests are humble and sweet. She actually just downsized and in her new place she has the Game Show Network, and for the first time, a DVR. My boys and mom have rewound many a silly game show moment this week. I love just listening to the four of them laughing together. I had a great laugh this week too, and it wasn’t game show-related. The boys and I were just arriving back to my mom’s condo and the cable guy, there to relocate her modem, happened to arrive at the same time. My mom and I went back to the bedroom with him to talk through the best placement. Then Sam came in too, almost pale with alarm. 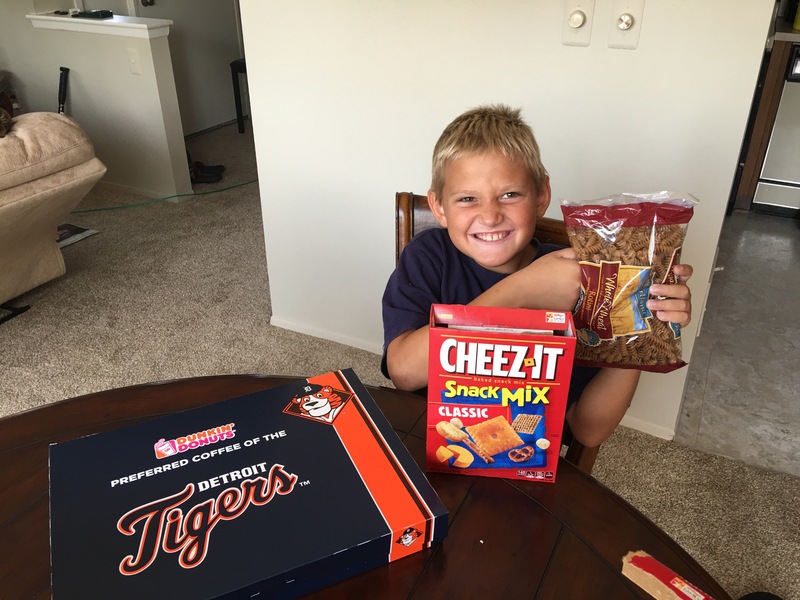 It’s important to know that Snack Mix, or “mix” as Sam has long called it, is Sam’s favorite food on earth. Cake? Ice cream? Pizza? Reese’s? Nope. Not even close. 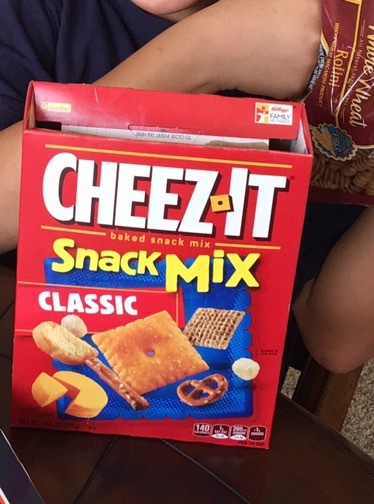 According to Sam the tastiest thing in the universe is Cheez-It Snack Mix. And he’s eaten it in mind boggling quantities since the age of two. Imagine his despair when he tore open the box, mouth already watering, only to find a bag of pasta instead of his beloved mix! Truly though I hope you and yours know the best news ever. Because life can be aimless without it, sorrow unbearable. When your chest is tight with hurt, and you fight off a deluge of tears, I hope you can cling to the truth that is the best news ever. A faultless man volunteered to pay the price for all your wrongdoing. You’ve been pardoned, ransomed even. Your account — and believe me you have one. whether you acknowledge it or not — has been settled. You face no judgement, it’s paid in full, assuming you accept the offer. And who wouldn’t? It’d be crazy not to. It may be a little weird, but it’s also the best news ever, ever, ever! Praying tonight that I’ll be faithful in sharing the best news ever and that you live by it! Greetings from Dayton, Ohio! Hope you’ve been having a lovely summer. We’ve reached that odd stage when — even though I pretty much wish summer would never end — we would benefit from some outside structure. Of course, it’s all sort of irrelevant now. We are headed to vacation in Michigan (hence the stop in Dayton) and as soon as we get back the boys go straight to school. It goes faster and faster with each passing year. You might be wondering, “Who on earth is Sienna?” Well, she’s my swagger wagon, my Toyoya Sienna, and yesterday she turned one. Poor girl wasn’t babied or broken in gently. Oh no. She was brand spanking new with 8 miles on the odometer on July 31. 2015. But I took this pic last night. 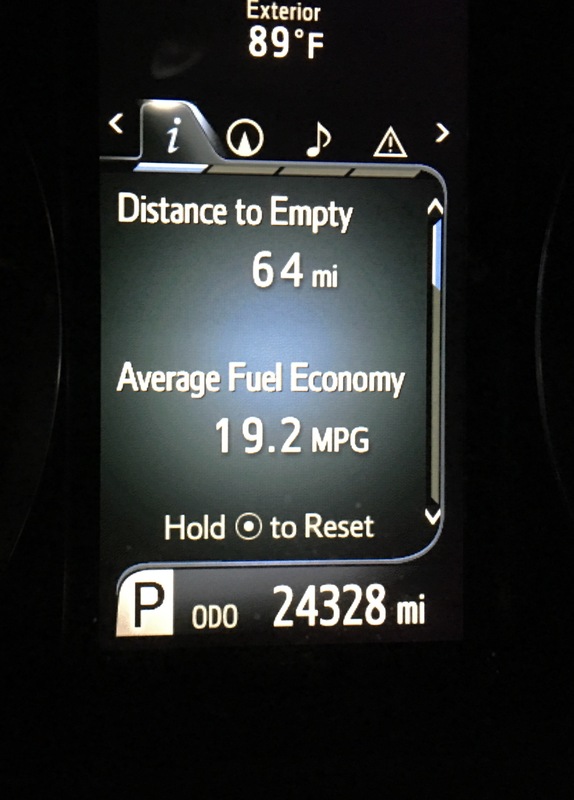 And yes that says 24.328 miles. That’s not just a heck of a lot of miles (a personal record even though I log a lot every year), it’s a great deal of time. If I averaged 45 mph for all those miles that would be 540 hours spent in the car, or 22.5 solid days. And there’s no way I could average 45 miles per hour. It’s not terribly infrequent that I get behind someone coming down the mountain who is seriously freaked by the descent and averages about ten miles per hour. But no matter how the numbers are crunched, suffice it to say that I’ve spent an absurd amount of time in the car this past year. From Philadelphia to Palm Beach, from Mackinaw City, Michigan to Sandestin, Florida, Nashville to Fripp Island, South Carolina, from Wilmington, Delaware to Fkorence, Alabama and many points in between, the minivan has faithfully carted us near and far. We’ve listened to many a tune, from practically every genre. I’ve listened to sermon upon sermon and book after book. We’ve shared stories galore and played hours and hours of family feud. We’ve traveled for pure pleasure, part business, for baseball and basketball tourneys, for a swim meet, a wedding and to relocate. In sum, sweet Sienna has seen twelve states. All those miles have also afforded me time to think too. Time to relive memories and dream big dreams, time to make mental to-do lists and time to think through lots of decisions. What I haven’t done as much as I should have is pray. Yesterday I was listening to the book on prayer recommended by the pastor I heard earlier that morning (ahh, technology). 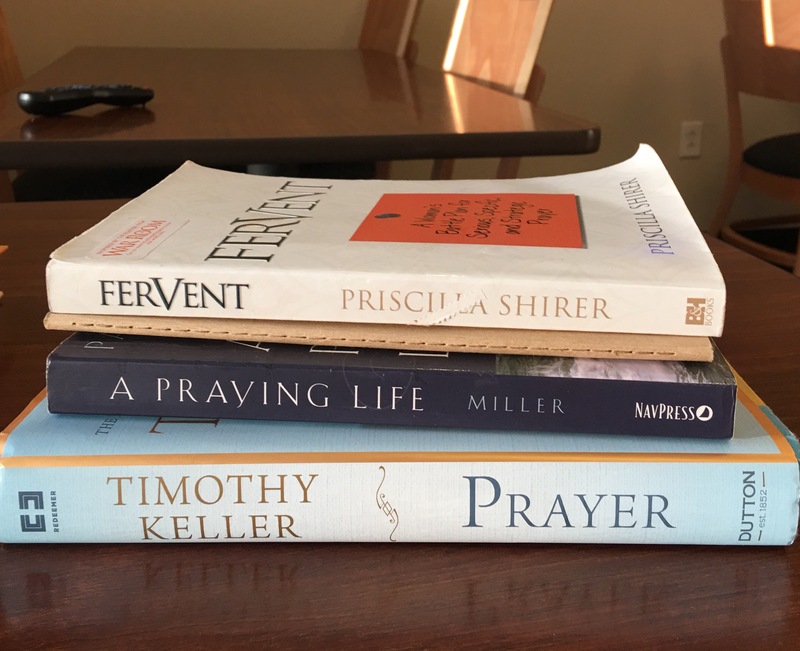 The author, E.M. Bounds, said, “The most important lesson we can learn is how to pray.” I spent a few miles analyzing that strong statement, and I’m not convinced it’s not a tiny bit of an overstatement. But I’ll concede that learning to pray is certainly one of the most important lessons we can learn. Jesus was a prayer warrior, frequently retreating by himself for fervent prayer. That simple fact is mind boggling. My sinless Savior who was God incarnate needed to pray? That alone says volumes about my need of it! Paul wrote we that we should pray without ceasing (1 Thessalonians 5:16-17). The darling Mrs. Nunery (my newly married niece) use to keep a prayer list hanging from her rear view mirror. I wonder what she’ll do now as a NYC pedestrian? But the point is, even though I seriously doubt I’ll rack up 24K miles again this year, I’m still going to drive a fair number, including 180 later this morning. So I’ll start today by spending more time praying in the car. If I really believe prayer mysteriously changes the course of the world, and I do, then how cannot I not devote more time to it? Also I just happened–you know just coincidentally–to pack these books before I headed to church yesterday. I mean it’s not like my life is divinely orchestrated or something! Ha. Right! 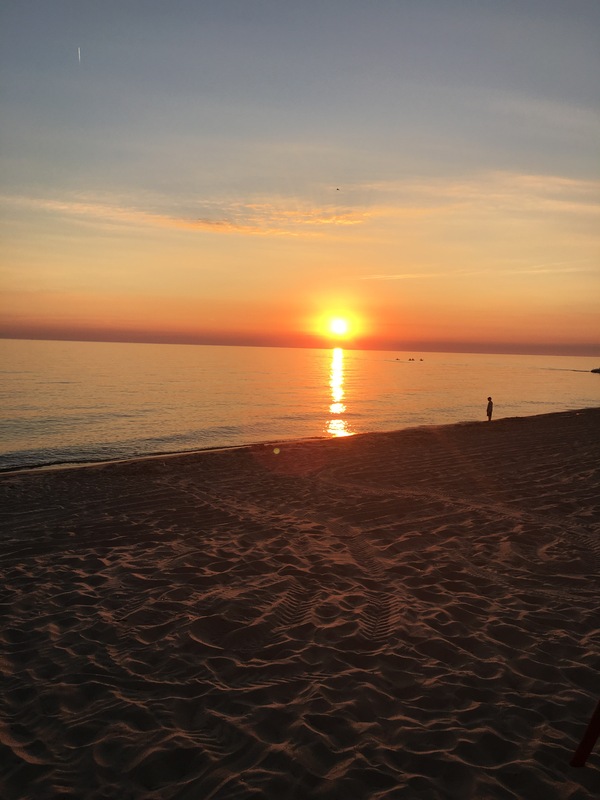 Abundant blessings on your last days of summer. May they be full of joy and drenched in prayer. I plan for mine to be.